Adios y Gracias, Rick! Goodbye and Thank you, Rick! I Heart Cooking Clubs (IHCC) has been cooking from chef Rick Bayless's recipes for the past six months and it is time to say goodbye! We will be starting with another chef for the next 6 months. My last recipe cooking from Rick ends with this "Creamy Chicken and Greens with Roasted Jalapenos" and I've listed out six of my most favourite recipes from Rick Bayless that I've tried out for the past six months. I wanted to choose only five, but ended up with six instead! For the recipe, you may get it from here. This recipes uses poblanos chiles, but since I could not find any poblanos and I have about 6 medium jalapenos left, I used that instead. For the past six months that I have been cooking from Rick Bayless's recipes, this is my least favourite. Somehow, it is just not for me. Just as the name of the recipe says, this is creamy, and tasty too and may be alright for some, like the hubby, he had a second helping! But, hey, considering that this is the only dish that I am not crazy about among all the dishes that I've tried, Rick Bayless is definitely in the list of one of my favourite new-found chefs! Love this salsa! It is so simple, yet so full of flavour. First time that I've made salsa and love it. Great with eggs, sandwiches, tortilla chips and just about anything. This lovely pesto is just so delicious! I finished almost all of it by spreading it on bread, yums! So little ingredients that packed so much taste and flavour! One other thing I've learnt is that Mexican cuisine uses lots of cilantro, and since I'm a cilantro fan, it suits me just fine! Another delicious recipe from Rick Bayless. This is a total winner with my kids! The salty olives with the sweet raisins, salsa and minced meat, makes the filling absolutely delicious! These meatballs are simple delicious! They are chewy and very tasty, along with the cumin scented sauce, is so good eaten over pasta! I am a fan of cornbread and these are downright YUMMY! If you love cornbread, you should really give this a try! I have never made any guacomole before this! And I'm totally into guacomole now! All the wonderful flavours from the avocado, lime, mango, onions, chillies and corianders comes together in one amazing mix! Eaten with tortilla chips is so addictive! I have learnt a little more about Mexican Cuisine, which is totally something new to me before this. Sourcing for ingredients like chorizo, poblanos and chipotle among other things is really a challenge, as they are not easily available over here. One thing that I've learnt from these 6 months is that roasted peppers and garlic smells incredibly good! There are lots of other recipes that are new and unfamiliar to me, but in time, hopefully I'll find some time to cover just that. Thank you, Chef Rick Bayless, for the past six delicious months! IHCC will be cooking with another chef, Madhur Jaffrey starting from October. We are going for Indian Cuisine and I am pretty excited, as Indian Cuisine is one of my favourites. My spices are all stock up and ready to go! To view other yummies from my friends, please do drop by IHCC and if you are interested to join us, check out the Welcome Page for the full details. It's time again for our Bake-Along! 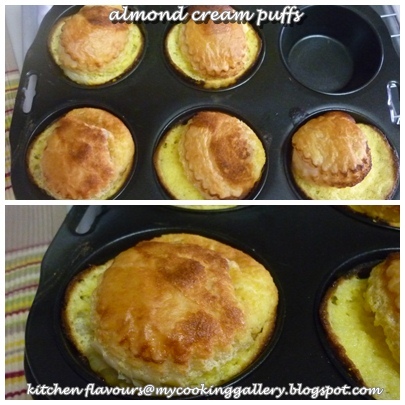 For this week's theme bake, my baking buddy, Lena from Frozen Wings has chosen "Cream Puffs"! I was really glad that this theme was chosen, which really 'pushed' me into trying out this yummilicious recipe that I intended to make for ages. There's a sticker sticking out from this very page which I have bookmarked for more than a year! Ah-ha! I bet I'm not the only one who has recipes bookmarked for ages! Don't we all! I made half a recipe, and got only 5. Used the store-bought frozen puff pastry, they really do make life easier! The pastry are cut into two sizes of rounds (3" and 2-1/2"), for the base and for the top. The filling is made up of eggs, flour, ground almonds, sugar and whipped cream. To assemble, simply place the 3" cut pastry onto the bottom of the muffin pan, scoop two tablespoons of the filling on top of the pastry and cover the top with the 2-1/2" piece, seal the two pastries together, brush with milk and bake. Easy, peasy! The only thing is I did not seal the two pieces together because when I placed the filling onto the bottom pastry, it covers the pastry, so I am unable to seal the bottom pastry with the top one. But that is not a problem, it turns out just fine! Eat it while still warm, nice and crispy! Scatter some icing sugar over the top before serving, yumssss! A definite hit with the kids and myself! The puff pastry, is of course, very light and crispy, I would not expect otherwise! And the filling is an absolute delight, not too sweet and very good! So if you would like to give this a try, make the full recipe! It is really good eaten warm, about 10 minutes right after baking, but be careful, the filling is hot! Reheat the ones that has gone cold, just before serving. Let's visit my baking buddies, Lena from Frozen Wings and Zoe from Bake For Happy Kids and all our baking friends who has baked along with us in the linky below. For our next bake, we will be baking World's Quickest Yeasted Coffee Cake from Cake Keeper Cakes by Lauren Chattman, page 39 or you may get the recipe here. The linky will start on 8th October right up to 14th October. Do join us, everyone's welcome. Roll out the pastry thinly on a lightly floured surface, and cut out ten 7.5cm/3in plain rounds and ten 6.5cm/2-1/2in fluted rounds. Keep the smaller rounds for the tops, and use the larger ones to line a patty or cupcake tin. Chill for about 10 minutes. Preheat the oven to 200C/400F/Gas 6. Whisk the egg yolks with the flour, almonds, sugar and vanilla essence. Fold in the cream and spoon into the pastry cases. Brush the rims with milk, add the tops and seal the edges. Glaze with milk. Bake for 20-25 minutes until golden. Cool slightly. Dust with icing sugar before serving. **These are best served warm, reheat any that become cold before eating. I have bookmarked about half a dozen recipes to try from Masterchef, Australia website, and somehow time seems to slip by real quick this month! 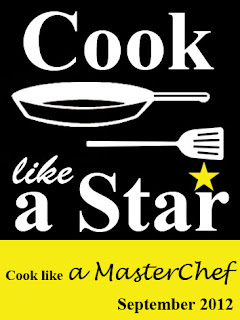 Well, this is my second submission to the blog hop event, Cook Like A Star, where the featured chef for September is "Masterchef" organized by my friend, Zoe from Bake For Happy Kids and her co-hosts, Anuja from Simple Baking and Baby Sumo from Eat Your Heart Out. Now this recipe is not from any of the contestants, but rather from the sponsor, Western Star. Ever since I've seen this recipe, I really wanted to give this a try as we all love prawns in my house! The recipe calls for 80gm of butter, but I used about 40-50gm. This is a really simple, quick and very easy dish to cook. It uses lime zest and the juice, and the taste of this dish reminds me very much of Thai cuisine. Surprisingly the recipe does not call for any salt, maybe the amount of salt in Western Star butters are sufficient, but I added in a pinch of salt according to taste. And I used only 1 small lime as I do not want it to be too sour. There's no water required at all for this dish, all the delicious gravy are really from the chopped tomatoes and the juices from the prawns. And I can see why this is recommended to serve with fresh bread, to mop up all the delicious gravy! We had this with plain white rice, the gravy is really good eaten with white rice, my kids certainly enjoyed this dish. 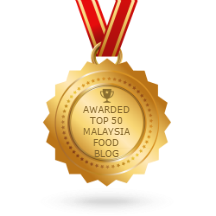 This is linked to Cook Like A Star blog hop, Celebrity Chef for the month September is "Masterchef", hosted by Zoe with co-hosts Anuja and Baby Sumo. Click on the link below to view other delicious yummies! Melt butter in a large frypan over medium-high heat until foamy, add garlic, chilli and prawns, cook tossing for 2 minutes until almost cooked through. Add tomatoes, lime juice and zest and coriander, cook, tossing for 1 minute. Serve prawns immediately in the pan with fresh bread or tortillas and let guests help themselves. It was one of those weekends when my kids had a late breakfast and nobody wants any lunch. So I browsed thru my cookbooks to look for something that I could make for tea-time instead, as I'm pretty sure when the clock strikes past 3 o'clock, they would want something for their tummy! 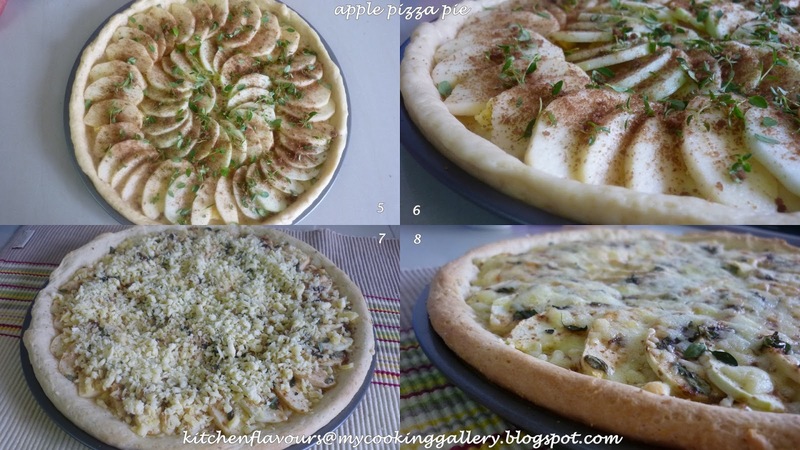 I found this wonderful recipe, Apple Pizza Pie, the name certainly caught my attention! Since I have some apples, which I really wanted to clear anyway, this is a perfect way to use them. According to the book, the base which is a yeasted butter pastry, is even suitable to make the regular savoury pizza. Mixture of Fuji and Granny Smith apples, and some thymes from my garden. The risen dough is placed on a pizza pan, the base coated with cornmeal. To make the dough, refer to the instructions in the recipe below. I use a rolling pin to roll out the dough to fill the pan and press the edges at the sides so that it forms an upstanding rims all around. Refrigerate for 10 minutes. Scatter with bits of butter all over. 5. Prepare the apples as per instructions below. 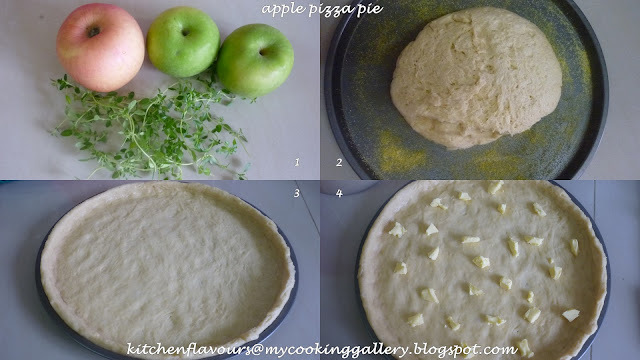 Arrange apples slices on the crust and sprinkle a mixture of cinnamon, sugar and rosemary (I use thymes) over the apples evenly. 6. Bake for 8 minutes in a preheated oven at 425F (I baked mine for 10 minutes), remove pan from oven, then lower the oven temperature to 375F. 7. Scatter the top with shredded cheese and continue baking for another 5 minutes until cheese has melted but not bubbling. (It took mine an additional 10 minutes more as it was not brown enough). 8. The baked pizza pie is ready! Testing time : Of course a slice was quickly cut barely 5 minutes out from the oven! Let me just admire the pizza pie first!! Haha! Review : I like it, the kids love it, my hubby not so! When you take a first bite, first you taste the saltiness and softness of the cheese on top, then you get the next taste of the apples, a little bit sweet and tender. The crust is lovely, with crusty crispy sides and bottom. Soft, spongy and tasty bread-like texture in the centre. It is especially good when eaten warm, my hubby does not like the combination of sweet and salty in this bake. My kids love it, there was no leftovers! Great with a cup of warm Earl Grey tea. I'll be using this easy crust for other savoury future bakes! Twelve Loaves, hosted by Cake Duchess, Creative Culinary and Life's A Feast, where the theme for the month of September is Cheese! If you haven't already, prepare the pastry and set it aside to rise for 1 hour. Meanwhile, lightly oil a large baking sheet and dust it with the cornmeal. When the dough has risen, without punching it down, turn it out onto the center of the baking sheet. Using oiled fingers, press the dough out into a 13-inch circle, smoothing it, if you like, with a floured rolling pin. Try to keep it of even thickness; you want to aviod making thin spots you can see through. Pinch the dough around the edge, forming an upstanding rim. Refrigerate the dough for 10 minutes. Preheat the oven to 425 degrees. Dot the surface of the dough with the butter. Halve the apples lengthwise. Place each half cut side down on a cutting board and cut into very thin slices. Arrange the slices on the crust, overlapping them slightly. Mix the sugar, cinnamon, and rosemary together in a small mixing bowl and sprinkle evenly over the apples. Place the baking sheet on the center oven rack and bake for 8 minutes. Reduce the oven temperature to 375 degrees. Remove the pizza from the oven and sprinkle with the sauerkraut, if using. Sprinkle evenly with the cheese. Bake the pizza for another 5 minutes, until the cheese has melted nicely; it shouldn't bubble. Do not overbake, since this is a buttery, porous dough, it tends to get fairly brown after about 15 minutes. Slice into wedges and serve as soon as possible. Measure the water in a 1-cup glass measure. Sprinkle the yeast over the water, mixing briefly with a fork. Set aside for 5 minutes to dissolve the yeast. Meanwhile, put the flour, sugar, and salt in a food processor. Pulse several times to mix. Remove the lid and scatter the butter pieces over the dry mixture. Pulse the machine 7 or 8 times, until the butter is broken into very small pieces. Add the egg yolk to the yeast water; blend with a fork. Remove the lid from the processor and add the liquid. Pulse the machine repeatedly, until the dough coheres, then run the machine nonstop for 8 to 10 seconds to knead the dough. Remove the dough and place it in a medium-size oiled bowl, rotating the dough to coat the entire surface. Cover the bowl with plastic wrap and set aside to rise in a warmish spot for 1 hour. If for some reason you're called away and you need to delay the rising, simply put the dough in the refrigerator. I rolled the dough out with the help of a small rolling pin into an 11-inch pizza pan. Baking time extended by another 10 minutes as the pastry was not brown enough. This is a lovely ginger bar with a touch of lemon. I made this a couple of months ago, just never got round to post about it. The taste of the ginger is not overpowering, you could definitely taste the ginger, but it is not overly strong. Because it has crystallized and ground ginger, instead of fresh ginger, you would not feel the heat from the ginger, and the ginger goes well with the honey and lemon. The simple glaze of icing sugar and lemon is nice, the glaze will harden, making it easier to stack the bars as they will not stick to each other. I love using crystallized ginger in bakes and could not resist popping some in the mouth when I chopped them to pieces! A lovely bar, with a touch of lemon, both in the bar and the frosting. The frosting will harden when it cools, but it is very nice, and this ginger bar is a good keeper. I kept the sliced bars for almost a week in an air-tight container, leaving it on the table at room temperature (no need to refrigerate), and I nibbled on them, mostly on my own, well not all of it! My kids are not overly fond of ginger, so I packed most of it for my hubby to take for this office colleagues. This makes quite a big tray, so it will be great to share. Otherwise, halve the recipe. I love the bits of ginger in the bar. The best way to eat this is to cut in small pieces to nibble and enjoy! Lovely with some warm Chinese Tea. Mix the flour, sugar, ground ginger and baking powder in a medium bowl. Melt the butter over a medium heat and immediately add to the dry ingredients; use a large rubber spatula to stir to a smooth, shiny dough. Add the egg, crystallised ginger, honey and lemon zest and beat vigorously to make a smooth dough. Scrape the dough into the prepared tin and use the palm of your hand to press it evenly over the bottom of the tin. Don't be concerned if the dough looks greasy, as though some of the butter has separated out. Bake the bars until well risen, firm and lightly golden, 20-25 minutes. While the bars are baking, use a small rubber spatula to beat the icing sugar and lemon juice together. If it's too thick to spread, thin by adding 1/2 teaspoon water at a time until it's right. As soon as the bars are baked, place a chopping board on the tin and use oven mitts to invert the hot bars to the board. Remove the tin and foil. Immediately use a small palette knife to spread the lemon glaze on the bars so that it sets as the bars cool. Use a ruler to mark, then cut into 5mm squares. Serving : Arrange the bars on a serving plate; the icing is dry, so they can be stacked. Storage : Keep the bars in a tin or plastic container with a tight-fitting lid between sheets of baking paper. Bake No. 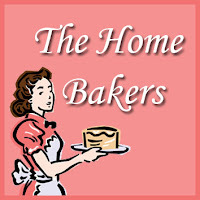 9 at The Home Bakers (THB). For this round of bake, Jasline from Food Is My Life has chosen Cinnamon-Apple Walnut Torte. Jasline is a talented baker and she always provides step-by-step photos for her bakes, a dedicated baker and blogger! If you have not already known Jasline, then stop by her wonderful blog and say hi! 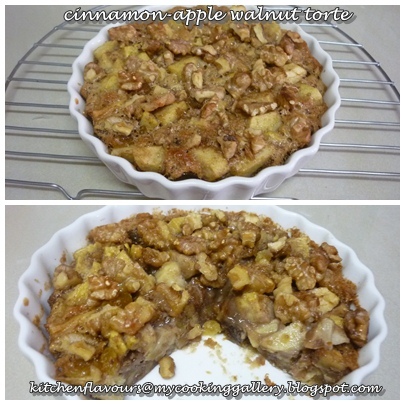 Cinnamon-Apple Walnut Torte is really like a crumble without any filling underneath! So if you love eating crumbles with crunchy top, then you would fall for this! The good thing is, it has no butter or oil whatsoever, I would consider it a healthy choice for a delicious satisfying dessert! I made half a recipe, and baked in a 6-inch pie plate. I was curious how this torte would turn out, as it contains very little flour. The only changes I made was to reduced the brown sugar to 1/4 cup instead of 1/2 cup for half a recipe. Option to use walnuts or pecans, and I used walnuts. Again the choice of whether to lightly toast the nuts, and due to laziness, I just mixed them in without toasting. The original recipe calls for the full recipe to be baked in a 9-inch pie pan for 30 minutes. I find that it took exactly the same amount of time, 30 minutes to bake my 6-inch pie plate crumbles for it to turn all brown and nice. There are four of us in my family, and each gets a quarter. I use a mixture of black and golden raisins and they are plump and juicy when baked. The apples has a slight crunch, and the walnuts are crunchy and nutty. The rest of the ingredients are a little amount of flour, an egg, vanilla extract and of course, the apples' best friend, the cinnamon! I served it with my homemade frozen vanilla yoghurt. This is the perfect dessert! The smooth creamy frozen yoghurt with a slight sourish tang is perfect eaten with this torte. You would not feel guilty eating this delightful dessert, it is almost fat free! wink! wink ( I say "almost" because the yoghurt is made from full cream milk, and is yummy eaten on its own! And even delicious made into frozen yoghurt!). Overall review : This is a delicious torte, simply a pleasure to eat. I like it that it is so easy to make, and is really good, served with some frozen yoghurt or ice cream. If you would like to give this torte a try, please do visit Jasline for the full recipe. And to see the rest of my fellow bakers delightful torte, please drop by The Home Bakers (THB). Mix together the yoghurt, sugar, and vanilla. Stir until the sugar is completely dissolved. Refrigerate for 1 hour. "What's In Your Lunchbox???" That's the theme at I Heart Cooking Clubs (IHCC) where we are cooking from Rick Bayless's recipes until end of September. So, what's for lunch??? A simple recipe from Rick Bayless that I knew my kids would enjoy for their lunch. Two of my kids favourites, eggs and potatoes!! Already a winner for sure with just these two ingredients! This is my lunch, Rustic Red Sauced Eggs with Crispy Potatoes. Well the potatoes are not crispy, they are steamed and then fried till brown all over before the beaten eggs are poured over and gently fried scrambled-like style to create large curds. They are then served topped with Roasted Tomato Salsa, from my previous post. A delicious, easy and simple lunch. The salsa is a little spicy and is perfect with the eggs and potatoes, great with some cucumber and juicy cherry tomatoes. My kids' lunchbox. The salsa is a little spicy for them, so they had some Honey Barbecue Baked Beans, which I made that same morning, to go with the eggs and potatoes. Some toasted garlic bread, slices of fresh cucumber and cherry tomatoes, completes their lunch box. They love the eggs and potatoes and already requested me to make this again! Have not decided what to have for lunch yet? Please do drop by I Heart Cooking Clubs (IHCC) to see "What's In Your Lunchbox? ", you might find what you are looking for! Steam the potatoes in a steamer set over boiling water in a covered medium-size saucepan until tender, 8 to 10 minutes. Remove potates from the steamer. Heat the oil in a large (10 to 12-inch), well-seasoned or nonstick skillet over medium. Add the potatoes and fry until golden on all sides, about 5 minutes. Beat the eggs with the salt and 1/4 cup of water in a medium bowl. Add the eggs to the skillet, cook, stirring gently to create large curds, until soft set, about 2 minutes. Serve immediately topped with generous spoonfuls of the salsa and a sprinkling of cilantro. "Dia de Independencia" is this week's theme at I Heart Cooking Clubs (IHCC) , where we are cooking up a feast to celebrate Mexican Independence Day! I've made some salsa! Simply because, when I think of Mexico, one of the things that comes to mind is Salsa! And I have never tried making my own before, I bought a bottle of salsa a couple of months ago for my Mexican cooking, and I wonder why did I not make it earlier, when it is so simple, easy and taste absolutely delish when homemade! And definitely much cheaper to make your own! When I read the instructions for making Fire-Roasted Tomato Salsa, it seems easy enough! The garlic cloves and jalapenos are being roasted till brownish all over and garlic are tender and soft. Love the smell of the roasting jalapenos and garlic! The garlic and jalapenos are then thrown into the food processor, whiz to chop and added in the rest of the ingredients, processed to a coarse slightly chunky puree, simple, quick and very easy! Season to taste with some salt and lime juice. The result is a wonderful, tasty and delicious salsa with the spiciness of the jalapenos and also I have used a can of diced tomatoes with mild peppers, a superb choice! This is a little too spicy for my kids, so I get to enjoy it all to myself! This salsa is great eaten with anything. I ate this yummy salsa with another of Rick Bayless's yummy recipe, that's for next week. Craving for some salsa, give this a try! This post is linked to IHCC, where we are cooking from Rick Bayless's recipes. To view the fiesta menu, hop on over! Roast the chiles and garlic. In a small ungreased skillet over medium heat, roast the chiles and garlic, turning regularly, until they are soft and blotchy brown, about 10 minutes for the chiles, 15 minutes for the garlic. Cool until handleable, then pull the stems off the chiles and roughly chop. Peel the skin off the garlic. Scoop into a food processor and pulse until quite finely chopped. Finish the salsa. Add the tomatoes with their juice. Re-cover and pulse until you have a coarse puree. Scrape into a serving dish. Stir in the cilantro and lime juice. Taste and season with salt, usually about 1/2 teaspoon. Your're ready to serve. Cornbread is one of my very favourite savoury bread. I have made a few recipes and constantly on the look-out for other good cornbread recipes. Those that I have made so far are all very good. When I saw this cornbread recipe over at girl versus dough, I knew that I MUST bake it! Firstly, again, yes, I love cornbread, secondly jalapeno is my favourite ingredients, in any savoury breads or dishes! Not to mention that corns are my favourite too and my family loves scallions, I even have some lovely scallions growing in my garden. And cheese, need I say more? Haha! Looks like, I have a lot of favourites! When they all come together in one bake, it spells out Yumminess! Usually cornbreads are really easy to make, just like this one. The dry ingredients are whisked in a large mixing bowl, and the wet ingredients in another. Put the wet ingredients into the dry ingredients, stir to combine and add in the rest of the ingredients like scallions, chopped jalapenos, cheese and corn. This recipe requires the batter to rest for 10 minutes before baking. Maybe to soften the cornmeal a little before baking? The original recipe is called Jalapeno Cheddar Skillet Cornbread and it is baked in a cast iron skillet. I do not have any cast iron skillet [er... any sponsors?? :-) ] so I used a 7" square baking pan for half a recipe. Some changes which I've adapted are, I omitted the salt since I used salted butter, and note that the cheese are usually quite salty. To substitute the buttermilk, I use a mixture of homemade yoghurt and milk, (ratio 2:1). More cheese are sprinkled over the top of the batter along with some sliced jalapenos before baking. As soon as the pan goes into the oven, boil some water, make a pot of tea, you would want to enjoy your cornbread with that cup of tea, trust me, you would thank me later! Freshly baked Jalapeno Cheddar Cornbread. I sliced it to 8 rectangular pieces. About 20 minutes after baking, it's taste-testing time! As soon as the knife cuts into the bread, I knew that this is a winner! It is so soft and tender! It has a beautiful sunny colour and looks so good! The first bite, oh my! so delicious, finished the first piece before continuing on with the photographs! It is so moist, soft, tender, with that wonderful cheezy taste of the Cheddar and the Jalapeno are not spicy at all, even my son ate it without any complaints, the only thing he says was "Mmm... very good"! I love the corns that has softened during baking, and the scallions adds a wonderful aroma to the bread. At first, I did intend to make some chili to go with the cornbread, but that intended chili was "abandoned" when I find that I do not have certain ingredients which I thought I had in my pantry! But then, these cornbreads are truly delicious eaten on its own! I finished two slices with two cups of tea for my lunch, and it was a very satisfying lunch! I'll be making this again definitely! And hopefully with some chili to enjoy it together! Thank you, Stephanie for sharing this lovely recipe. Twelve Loaves, hosted by Cake Duchess, Creative Culinary and Life's A Feast, theme for this month is "Cheese!" The measurements below are adapted for half a recipe, for the full original recipe, please visit girlversusdough. Preheat oven to 350F. Grease and line a 7" square cake pan. Whisk together flour, cornmeal, sugar, baking powder and salt (if using) in a large bowl. In a separate bowl, whisk together buttermilk, butter and eggs. Stir the wet ingredients into the dry ingredients and mix until well combined. 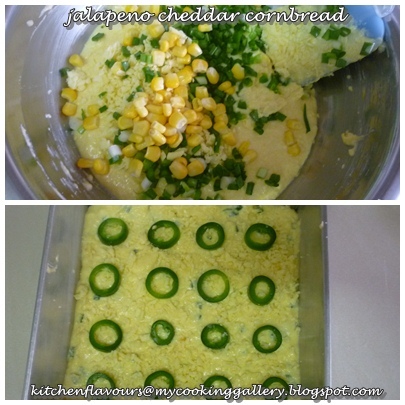 Add 1/2 cup cheese, scallions, corn and chopped jalapenos to the batter and stir to combine. Let rest for 10 minutes. Pour batter into prepared pan and top with remaining cheese and sliced jalapenos. Bake until edges are golden brown and toothpick inserted in the centre comes out clean, about 30 minutes. Cool pan on wire rack for 15 minutes, slice and serve. This is a really simple cake, just as its name, Everyday Yoghurt Cake, the cake chosen by my baking buddy, Lena from Frozen Wings for our Bake-Along No 32. I think that there will be mixed reviews from my baking friends for this bake. For one, this cake is quite unlike other cakes. According to Lauren Chattman, this plain cake has a light and airy texture, and can be "dressed" up in various ways by placing a paper doily on top and dust with confectioners' sugar for a lacy decoration. And it can be served with some yoghurt and sliced fruits on the side. I decided to leave it plain as it is. This cake rises well and bakes up beautifully. Light and airy? The texture that I got was a little dense, but very soft, moist and smells really good. This is the kind of cake that goes well with a cup of coffee or tea, something simple but satisfying. My overall review : I like this cake. The dense texture is really a soft, moist, and good dense. This cake is made from very simple basic ingredients, that I was surprised it could turn out rather tasty. I kept a few slices and ate them the next afternoon, and the slices has got a little more dense but still remains soft. I enjoyed these slices with a cup of black coffee. Very nice! To see the others review on this cake, please do visit my baking buddies, Lena and Zoe, and all our baking friends who has baked along with us in the blog-hop linky below. 2. 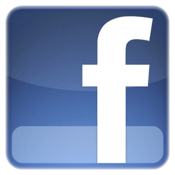 Please link only new and current post, related to the current bake or theme. Preheat the oven to 350F. Grease the bottom and sides of a 9-inch round cake and dust it with flour, knocking out any extra. Whisk together the flour, sugar, baking powder, baking soda, and salt in a large mixing bowl. Whisk together the yoghurt, oil, eggs and vanilla in a medium mixing bowl. Pour the yoghurt mixture into the flour mixture and stir until just moistened. Let the cake cool in the pan for about 5 minutes, invert it onto a wire rack, and then turn it right side up on a rack to cool completely. Dust with confectioner's sugar, then slice and serve.